In what was a war for the British 55 kg title, chmapion Christi Brereton was able to retain by getting the unanimous decision over Alexis Rufus. Brereton cut Rufus in the first round with a well placed elbow. with Rufus getting an elbow of her own in the second, cutting Brereton. It was a battle between Rufus’s hand and Brereton ‘s body kicks. In the end it was Breretron taking the title and surprising a lot of fighters in the Muay Thai community. 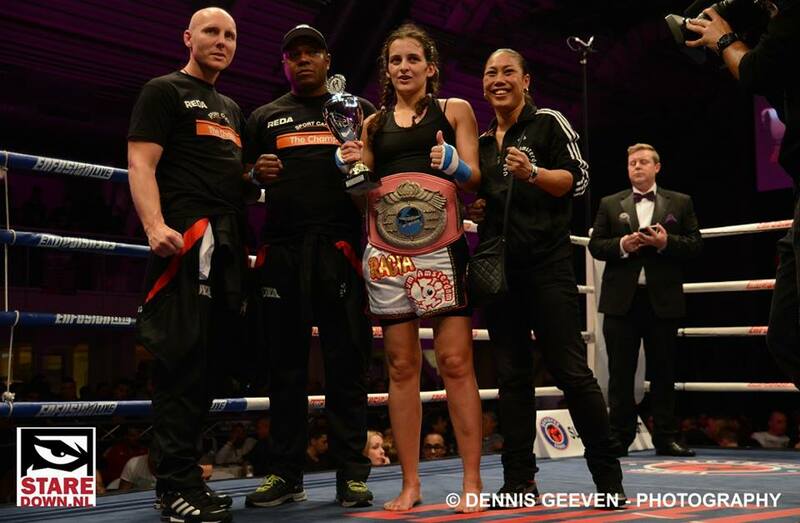 At Enfusion Live on Amsterdam, Holland’s Rachida Bouhout was able to out class England’s Vicky Church to retain her 64 kg World Title. Bouhout punished Chruch’s legs in route to a unanimous decision win. Iman Barlow was able to retain her 54 kg Goldenbelt World 54 kg title in England over Holland’s Maritzarda Hersisia in what is a contender for KO of the Year. You can watch the headkick KO here. In Milan, Italy under K-1 rules Silvia La Notte defeated Ilaria Stivanello by decision. Maria Lobo defeated Victoria Lomax by points in Spain. The world famous Lumpinee Muay Thai stadium is one of a few to have banned females from fighting within it’s walls. 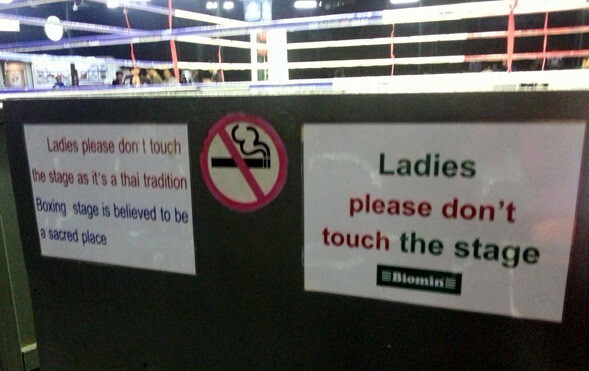 Lumpinee had a tradition of this in the past, and with the new updated facility, a sign has appeared that states it’s a Muay Thai tradition for women not to touch the ring. Sylvie von Duuglas-Ittu wrote a great article about this injustice and the history behind the discrimination on the 8 Limbs website. MMA fighter Michele Gutierrez will make her Muay Thai debut at Lions Fight 14 March 28 in Las Vegas. She will take on Larissa Freitas on the main card. The match joins Cyborg Justino taking on Jorina Baars. Both matches will air on AXS TV in the U.S. Lion Belt Fight Night in France will be holding a one night female 54 kg tournament March 8th. Among the participants are Ukraine’s Lena Ovchynnikova, Switzerland’s Deborah Semeraro, France’s Soraya Bucherie and England’s Ruth Ashdown. Awakening Muay Thai returns March 23 with set of three great matches in Penzance, Cornwall, UK. 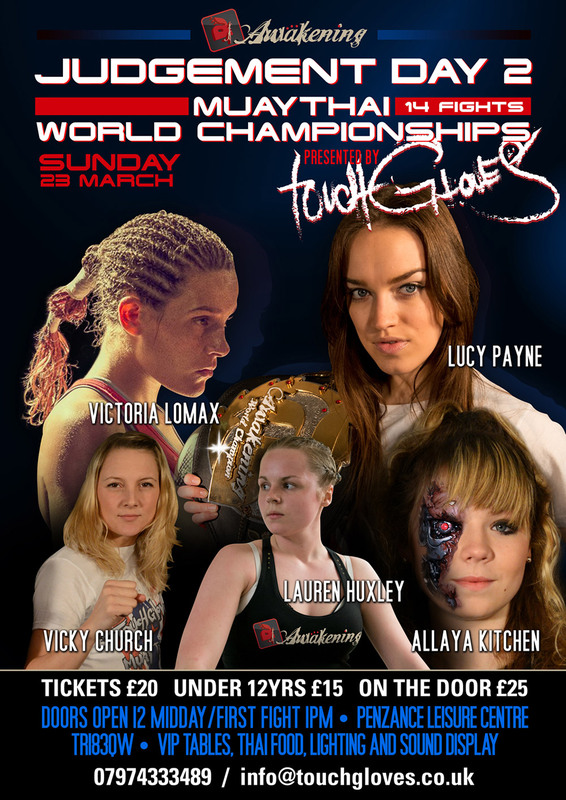 Muay Thai Newcomer of the Year Lauren Huxley will take on fellow Brit Vicki Church. More matches are expected to be announced in the coming weeks. Clair Haigh will return to action March 29th as she will face in Anke Van Cestel in Luxembourg. Lion Fights vet Angela Hill (1-0) will take on Ashley Nichols (3-0) in a title bout for Friday Night Fights at 50 kg in Queens, NY.